Nothing says winter like soup. When there’s a foot of snow on the ground and the thermometer is stuck at 20 degrees, there’s nothing as comforting as a nice, hot bowl of soup. And thanks to the magic of the Crockpot, it’s also really easy to make. Just throw everything into the crock in the morning, and when you come home in the evening, soup’s on! 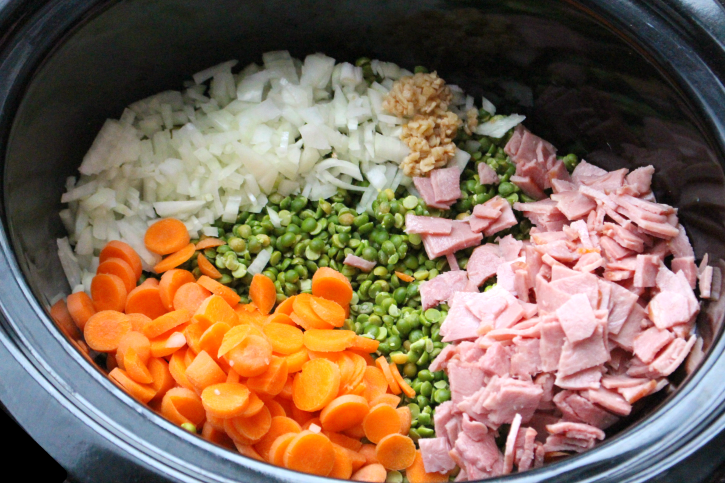 This Crockpot Split Pea Soup is as easy, and as satisfying, as it gets. Just chop up your veggies and some turkey bacon, dump them in the pot with some other kitchen staples , and press go. What could be simpler? And if you want to make this a vegetarian soup, hey, no problem. 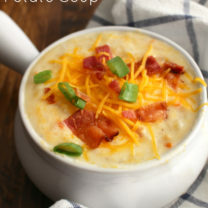 All you have to do is leave out the bacon and toss in a couple of medium potatoes, cut into bite-sized cubes, to give it a bit more bulk. If you miss the smoky flavor from the bacon, you can just add a bit of “liquid smoke,” which you’ll find on the flavorings shelf at your grocery store. It’s powerful stuff, so try just a few drops first, and then add more to taste. Either way, meatless or meaty, this soup is real stick-to-your-ribs comfort food. All it needs is a good, chewy bread to make a complete meal. 1. Place all ingredients into a 6 quart crockpot. Cover and and cook on LOW for 7-8 hours or on HIGH for 4-5 hours. Here is the turkey bacon I used. LOVE this stuff! 2. Remove bay leaves before serving. We love to serve our Crockpot Split Pea Soup with grilled cheese sammies or some warm chunks of bread! Do you love soup? 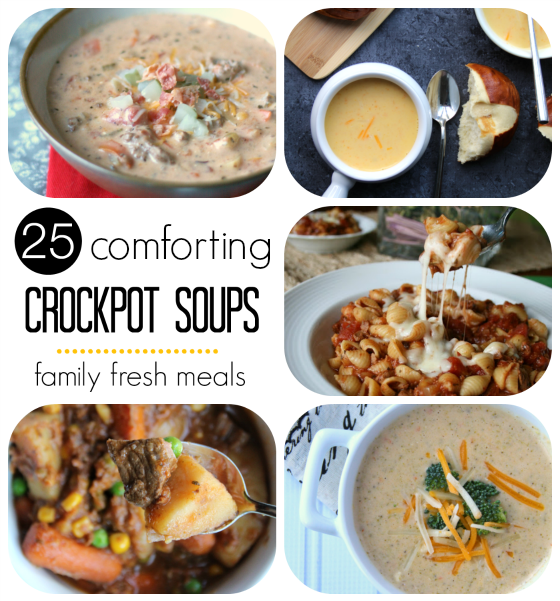 Make sure to check out my favorite crockpot soups! 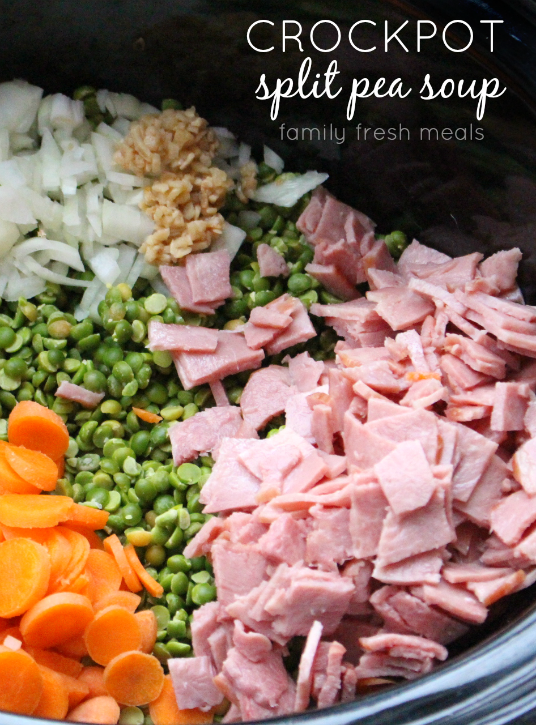 Here is what I used to make this Crockpot Split Pea Soup! 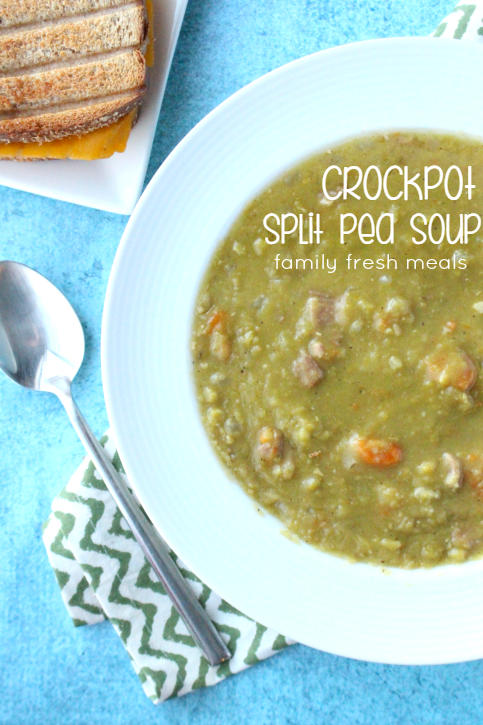 This Crockpot Split Pea Soup is as easy, and as satisfying, as it gets. Just chop up your veggies and some turkey bacon, dump them in the pot and press go. Place all ingredients into a 6 quart crockpot. Cover and and cook on LOW for 7-8 hours or on HIGH for 4-5 hours. Remove bay leaves before serving. We love to serve our Crockpot Split Pea Soup with grilled cheese sammies or some warm chunks of bread! Wow! That looks absolutely wonderful. Gorgeous warm soup. 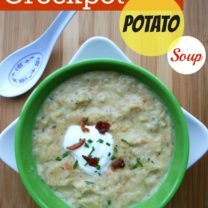 As a very recent “discoverer” of the joys of the crockpot, gotta say this recipe/method is a total winner! Years ago, my mom made great stovetop pea soup (similar imgredients), but this is as good–or better–with practically no work or attention! Yes, it does look wonderful– so much that I am cooking it today! It is snowing again! Ugh! This should be a wonderful way to say good bye winter! I made this today, it’s amazing! The only thing I forgot to buy was the celery but it made no difference to the end result. My husband inhaled it and asked for a second helping. Thank you! Do you cook the turkey bacon prior to adding to the crock pot? No, the bacon will cook along with the soup. 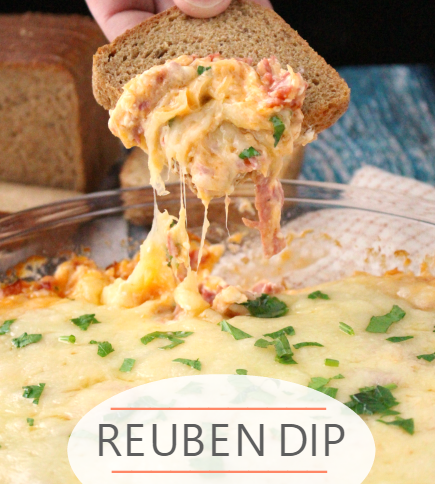 i am making this today with a left over ham bone . im so excited ! i love soup! thank you for this awesome recipe!!! I’d say definitely, just omit the chicken broth until you add to the crockpot! Will the split peas “melt”? Mine’s been cooking on low for 6 hours and so far everything is solid and it looks nothing like yours! Not as smooth, I mean. Did you blend it after cooking? Thank you so much for this easy, delicious recipe! I made this soup this afternoon with yellow split peas and ham. It yielded so much I am having my parents over to enjoy. It doesn’t say to soak the peas first, so I’m assuming that you put them in dry? I haven’t had split pea soup in forever so I want this, but I’ve never made it. Corey answered me below–you don’t need to pre-soak/cook them for this. I made it a week or so ago without doing so and it was fine. Made this on Monday. 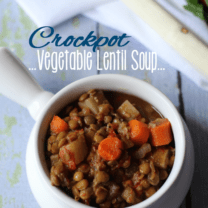 I tried another slow cooker split pea soup some weeks ago and was a little disappointed. Only a cup of peas was used, so it was far more brothy with some peas floating around. The pictures for your soup looked far more promising, and I was not disappointed! It’s that wonderful sludgy split pea soup that you could stand a spoon up in! It is exactly what we were looking for! I might try pan-frying the bacon at least a little next time to see how that works out, but this is still pretty awesome as-is. 🙂 I love how densely packed this is with vegetables. I want to work more veggies into my and my boyfriend’s diet, but it’s hard when I’m so lazy. I don’t like cooking on days I work, and they have the audacity to have very little shelf-life! So this is just awesome. A nice veggie-packed thing to sit around to be nommed on through the week. I’ve got a maple ham in the slow cooker at this very moment that should be awesome to eat alongside (or in!) this, too. Thanks so much for the recipe! For the thyme, should it be fresh? Or can I use ground? Thanks! Yes, I think halving the recipe would work great! Do you know what the calories per cup would be? This was amazingly good and I am sharing it with family and friends! I used some leftover ham from Thanksgiving and we had it on a cold and rainy night with some warm bread. Lots of leftovers too! I will probably add a small amount of salt next time, but it’s hard to know how salty the ham will make a soup, so that’s probably something to save for last. Not sure why my comment seemed to get skipped over. I was wondering if you have to pre-soak the peas at all? I know it doesn’t say it, but I’d rather ask a stupid question than be sorry. Do you think frozen peas will work instead of dried? I have so many of them! I don’t think they would Beth. Sorry. I’d guess that with frozen English peas you’d have to leave out the water and perhaps some broth. Since the recipe calls for 16 oz dried beans and 16 oz water for them, you might try using 32 oz frozen peas. You’d may have to “blend”, perhaps just stir vigorously, the finished product a bit to loosen the pea contents from the shells, and you’d probably end up with a more fibrous soup, depending on how tough or delicate the peas were (they vary widely as you know). I have this in my crock pot at home as I type! I put in about 1.5 pounds of ham steak and two ham hocks. I hope it comes out good…can’t wait to get home and find out! Thanks for the recipe! The last time I made split pea soup on the stove I idly wondered how I would adapt it for a slow cooker. One thing, though: In your instructions for making this vegetarian you should probably suggest using vegetable broth instead of chicken broth…since chicken isn’t vegetarian. ? Trying your recipe today…put a left over ham bone in and plan on cooking for more than 8 hours….hope the soup will be ok??? 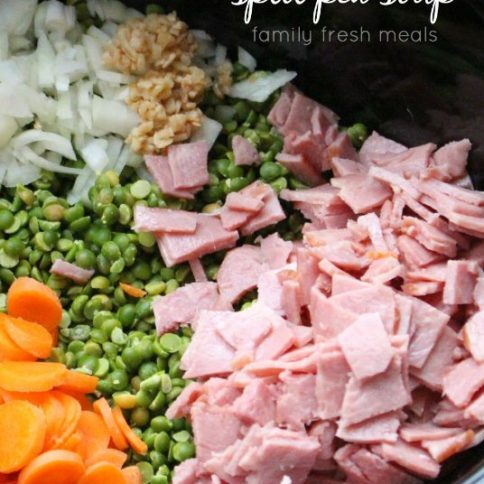 Plan on dividing the soup into one serving containers…sharing it with my daughter…we are the only family members that enjoy split pea soup!!! This soup was so simple but absolutely delicious! I made this and just got done devouring a bowl. It was sooooo good! Perfect bowl of split pea and ham soup. I used packaged cubed ham instead of turkey bacon. This recipe is beyond easy and spot on. Thank you for sharing this! 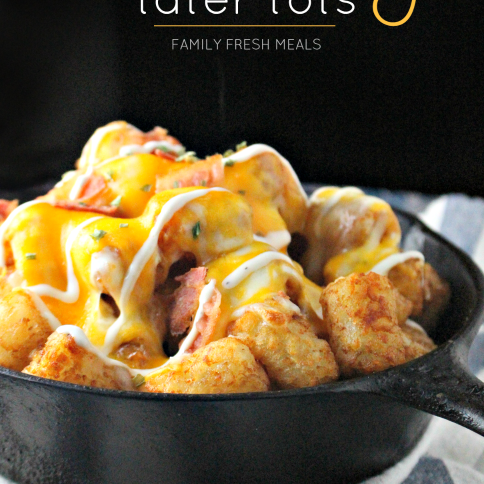 It was a great starter/base recipe for my family. After some tweaking it is now perfect for us. Thanks for these great recipes. I’m going to show them to my nephew. He does most of the cooking for him and dad. He needs some help though. He cooks everything on high so the meats get over done. And little variety wouldn’t hurt either. This was delicious! I used ham and it was so good! It was just a little thin so next time I will make it with the broth only and add a little water if needed. It tastes delicious, but after 6 and a half hours on high the peas were still really hard in mine. I know that not all crockpots are calibrated the same, but an hour and a half longer than what is says in the recipe is a little weird and my crockpot has always followed recipe lengths pretty well. I got too impatient waiting for it to finish that I dumped it all into a pot and put in on the stove for about 45 minutes. It was probably my problem, and not anything to do with the recipe, but make sure to give yourself a lot of extra time when you make it. I made this soup today for dinner and it turned out great! Having with baguette and a salad. Great soup for a fall day. Try using a smoked pork shank instead of ham or a hock. (large batch) I top mine with parmasian cheese and sour cream. Crumbled bacon works well too. The most awesome way to serve split pes soup is after it is all mushy either in crockpot or oven, remove from heat source, add a can of EVAPORATED MILK. AMAZING!!!!!!!!! This is my go to split pea soup recipe. It is so delicious and healthy! I made it again tonight, and after cooking for over 8 hours, the peas are still hard! Must be a bad batch of peas or something?? I don’t know if it’s salvageable. When my peas do what they’re supposed to do, and soften, this is an excellent recipe! My soup turned gelatinous when refrigerated and looks gross. 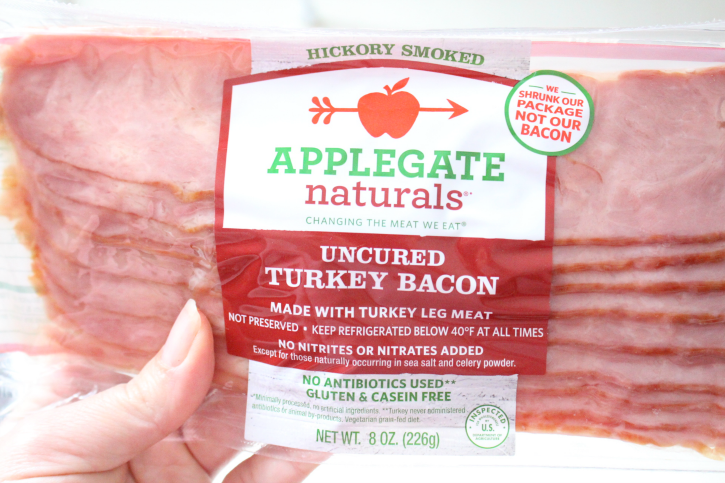 I used normal Applegate bacon. Is this normal? Im going to try this today. Ive never even thought to make split pea myself because it always sounds so complicated. Do I have to put the onion in? My family is not a fan of them. This recipe is worrying me because a lot of people are saying there peas are not softening. I hope mine do! My grandmother used to make excellent split pea! She would always use a ham bone which I do not have. She was an AMAZING cook! When she passed away all of her recipes were lost. ? So Im starting my own recipe notebook to pass down to my kids. My mom is at home sick with the flu and Instead of chicken noodle I’m going to try the split-pea. Her favorite! Fingers crossed. I’ll keep you posted. What is serving size to serve to 8? Made the split pea soup and my guy loves it so glad for your receipe. Made it exactly as receipe called for except omitted the bacon. Tastes great. I used diced andouille sausage instead of ham, and whisked in a little cornstarch to thicken it. Followed recipe to a tee and its soupy, not thick like it’s supposed to be. Very disappointed……I need a better recipe. Is split peas are lentils? ?three colors?orange,yellow and green. I have this in my crockpot now. I am so excited to try it! No one I know had a crockpot recipe so I am anxious to see how this one works for my hubby and me!